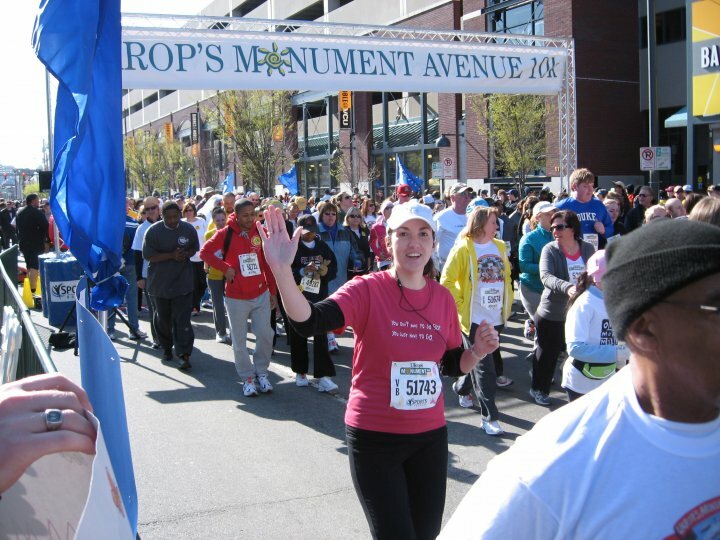 Me at the starting line for the Monument Avenue 10k. My shirt reads, “You don’t have to go fast. You just have to go.” I wear it for all my races now. When I first started blogging here, I mentioned that I’m a runner. Well, not so much a runner as a very slow jogger, but the point is that I can get my feet moving in a forward motion that’s faster than a walk. I also mentioned that on occasion I do crazy things like 10k’s. What I didn’t mention was that up until a couple of years ago I couldn’t even run (jog) a mile without stopping. Now, I’ve been pretty fortunate that I’ve never really been overweight- I’ve been blessed with a great metabolism for which I thank my mom’s DNA. However, being slender doesn’t necessarily translate to being athletic or fit. I was never either one of those things. Running The Mile in school always made me moan with dread, and I usually ended up walking most of it while panting pathetically and whining with my other athletically-challenged friends. Runners were “those” people. Not me. At all. So how on earth did I start with this 10k business? Well, a few years ago my husband found out that he could get free registration for the Monument Avenue 10k. He’s Mr. Athletic and he loves a good deal, so to him it sounded like a fun run to do with his friends and he signed up. I thought 6.2 miles sounded ridiculous and decided that this was something I had to see. We arrived at the race, which takes place in downtown Richmond in the spring, and I was amazed. Hundreds of people proudly wearing their race numbers waited behind the starting line, fidgeting with anticipation. Thousands more, both runners and spectators, wandered around in the surrounding area (the race usually has 10,000+ participants). Music blasted over loudspeakers and an emcee enthusiastically announced the start of each wave. Whenever the starting gun went off, a roar went up from both the runners and their fans cheering from the sidewalks. Despite the gloomy, rainy weather, the energy of the crowd sizzled and sparked. It was like a block party. As I watched the waves of runners go by, both young and old, and I saw the spectators yelling and ringing cowbells and handing out high-fives to them, something happened inside me. I was inspired. I realized that this race wasn’t really about athletic prowess or skill. It wasn’t about who was the fastest or the strongest. It was about who had the guts to start and who had the will to finish. I knew I had no athletic prowess or skill, but I was pretty sure I could muster the guts to start and the will to finish. Right then and there I decided that next year, I would run that race. And I wouldn’t be struggling- I wanted it to feel good, to feel comfortable (well, as comfortable as it can be to run 6.2 miles). That was my goal. As one who is athletically challenged, I knew I had a long way to go, so I needed a game plan. I started doing research. I learned about heart rate monitors and how they can help you train, so I invested in one and started going. My first goal was to run a mile without stopping. Within a few weeks, I could. My next goal was to run my whole neighborhood (2.2 miles) without stopping. After a couple of months, I could. My next goal was 3 miles. Check. I began to realize that if I could do one mile, then I could always do one more. I ran 4 miles. The month before the race I ran 5. I decided to save that last mile for the race. Mostly because I didn’t want to overexert myself right before the race- but also because I was confident that I could. I had reached every other one of my goals, right? In the months prior to the race, I would dream about it, both while awake and asleep. During my runs, whenever I felt like it was too hard I would imagine myself in downtown Richmond, out on that course, people cheering me on. At night I would have dreams that I was flitting through the race, easy as pie, just trotting along, breathing easy as the miles stacked up behind me. Those dreams always reminded me of the dreams I used to have when I was little that I could breathe underwater- something completely impossible, and yet I was doing it! On March 27th, 2010, I had a race number pinned to my shirt and I was in the throng of people waiting behind the starting line. When that gun went off, I waved to my parents, my brother and sister-in-law, and my husband and kids (who were holding up homemade signs saying, “GO MOM!") and I took those first steps into finally achieving my dream, knowing I could do it and yet still in disbelief that I was actually going to try. Over an hour later, I crossed the finish line at a sprint (because if you’re going to do it, you might as well do it with umph, right?) having run the entire race. Since then I have run it a second time (last year I was pregnant so I couldn’t) and I have also completed 2 5ks. I did what would have been impossible for me only a few years ago. Did I suddenly get more athletic? Did 6.2 miles suddenly become a shorter distance? Did I have a personal trainer who worked some kind of athletic magic on me? Did I get amazing technologically advanced shoes? No. The only thing that changed from when I was a whiny kid on that middle school track was me: my attitude and my belief in myself. I knew it would be hard, but I did my homework, made a game plan, and set goals. But most importantly, I believed that I could. This is my way of telling you that if you can find the guts to start and the will to finish, you can do hard things too. You don’t need to suddenly become a better writer, you don’t need the publishing industry to suddenly get easier, and you don’t need a genius editor to critique your work. Certainly, all of those things are helpful, but what you really need is you- a positive attitude and a belief in yourself and your dreams. Cheesy and trite? Perhaps. But true, nonetheless. I can honestly say that my experience training for the 10k changed my life. Not only am I now an avid runner (2-3 miles is the norm for me now on a regular basis- I’d do more if I had time!) but my perception of myself has changed drastically. I see myself as being strong, capable, and I firmly believe anything is possible if I set my mind to it. Heber spent many hours practicing to improve his handwriting. Some years later he received an award for having the best handwriting in the state. He also taught handwriting and bookkeeping at a university. Boy, if that doesn’t convince you that we can do hard things, I don’t know what will! I had the guts to start and the will to finish. I can do hard things- and so can you! What hard thing will you try this fall? A great, inspirational message to all. As an aside, I remember your before and your after. I bear witness to the magical transformation in your countenance and mindset! What a wonderful story to begin my week. Thanks!